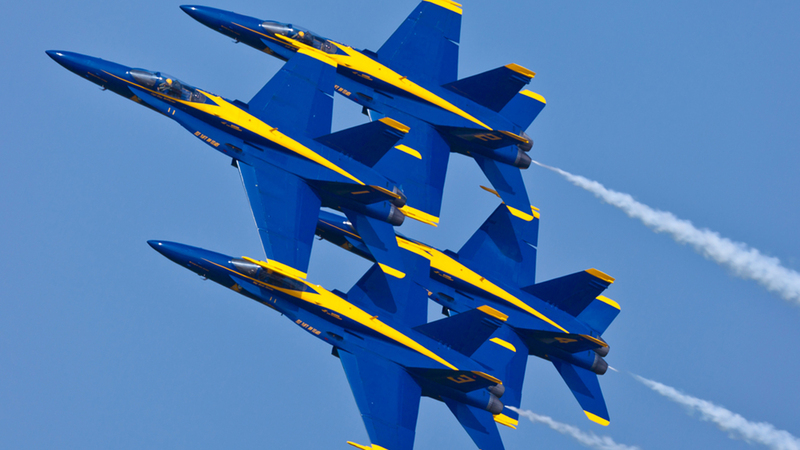 US Navy Blue Angels in F-18 Hornet planes perform in air show routine. SMYRNA, TN -- A U.S. official says the pilot of a Blue Angels jet did not eject when the aircraft crashed in Tennessee and likely was killed. The official spoke Thursday on condition of anonymity because the official was not authorized to discuss the matter publicly. The Navy says the pilot was beginning to take off during an afternoon practice session when the crash happened. The pilot is not being identified until next of kin are notified. Five other F/A-18 jets landed safely moments later. The Navy says it is investigating. A Blue Angels F/A-18 fighter jet crashed Thursday near Nashville, Tennessee, where the team is scheduled to perform at an air show this weekend, the Navy said. There are no details yet on whether the pilot was injured in the crash. The Blue Angels were practicing for the show. This is the second fighter jet crash of the day for the military's elite fighter jet performance teams. A member of the U.S. Air Force Thunderbirds crashed in Colorado following a flyover for the Air Force Academy graduation where President Barack Obama spoke. That pilot ejected safely into a field. People near the crash site told The Tennessean newspaper (http://tnne.ws/25DlrLt ) that they heard a huge explosion and saw a massive plume of smoke when the plane went down. Jennifer Elliott, who had been watching the jets practice before going inside her house, said everything shook. "It sounded like car crashed into my house," she said. Rebecca Durand told the newspaper she thought the jet was performing a stunt when she saw its nose come straight down. "Instead, I just saw this big orange explosion," she said.